With the drawers primed and drying, it is time to prime the body of the dresser. As with the drawers, sand if desired and then ensure all the to-be-painted surfaces are dust-free and clean. The top of my dresser was quite scratched and marred. I could have filled the deep scratches with wood filler and then sanded the top to make it smooth. However, the amount of sanding needed would have generated a lot of dust, and I was not able to carry the dresser outside. Rather than dust bomb my house, I opted to not do any sanding. The top won't be seen much anyway because I intend to keep using the satin and lace fabric across it. Apply the primer with a brush for the small or curvy parts and a small foam roller for the flat areas, such as the sides and top. I used Zinsser Bulls Eye 1-2-3 primer (tinted grey). Tip for painting furniture legs/feet: Place a couple of coins or a small piece of cardboard under the center of each foot so that the sides of the foot are not quite touching the ground. This allows you to paint the feet without having them stick to the surface beneath. A piece of aluminum foil beneath each foot will catch drips. Paint the inside and sides of the drawers. I used "Wild Elderberry," the same purple as my bedroom walls. Paint the drawer fronts, including the small bits on the side which will show when the drawer is closed. If you plan to do the color-on-color stenciling, be sure to use a matte paint. I used Behr Premium Plus Ultra "Black" in matte sheen. Next, paint the body of the dresser. I used the matte paint on the sides, where I will do the stenciling. For the small pieces on the front and along the bottom, I used the same color "Black" in a semi-gloss sheen to make a nice sort of frame for the stenciled drawers. The photo below shows only one coat; I added a second coat. Even with tinted primer, black almost always needs two coats. My dresser is finally receiving its long-overdue makeover! :D It's being painted matte black with gloss black stenciling to match my chests of drawers. First, empty the drawers and take everything off the dresser. Next, put on your extra fashionable, ultra glamorous painting clothes. Including the shoes you once dropped a loaded paint roller on. Then, prepare your workspace. I cover my table and the surrounding floor with thrift store sheets. Back at the dresser, pull out all the drawers. Remove the knobs/handles/pulls. If you're going to reuse them, be sure to keep all the screws. Sand the drawer fronts if desired. My drawers were in pretty good shape, so I did not do any sanding. Ensure all the surfaces you intend to paint are clean. You can use whatever cleaner you like as long as it doesn't leave a residue. Allow all the surfaces to dry. Now it's time to prime! Primer provides good adhesion on slick surfaces such as laminate or glossy paint. If you plan to use a dark color paint, have the store tint your primer. There are many primer options; I like Zinsser Bulls Eye 1-2-3. I apply it with a brush and a small foam roller. Then immediately use the roller for the flat surfaces, blending into the still-wet paint you brushed on. Don't allow the brushed paint to dry before you roll on the rest of the paint. For each drawer, I primed the inside and then the outside front and sides. I did not prime the outside back or the bottom, allowing me to handle the drawer enough to set it aside to dry. Repeat with each drawer until all the to-be-painted surfaces are primed. I didn't bother with the inside bottoms of the drawers because I intend to cover them with adhesive shelf paper. While the drawers are drying, address the knobs/handles/pulls if needed. I like the shape of my pulls but not the dull gold color. A little spray paint will fix that! I like to lay out my to-be-sprayed items on a piece of cardboard. After spraying, I can simply pick up the cardboard and move everything inside without disturbing the still-drying items. I like the color of Rust-Oleum Universal satin nickel paint, but not the sprayer. The mist is too fine and doesn't cover very well. I find it's much easier to use a series of primer and paints. I always use Rust-Oleum Painter's Touch gray primer before spray painting anything. It covers amazingly well. Just a couple of passes and my dull gold pulls were gray. Next, I used Rust-Oleum metallic silver. It covers pretty well. Finally, I used the satin nickel to tone down the super shiny silver. The key with spray paint is to apply light coats. You don't have to wait between coats; just keep spraying additional light coats until you get the coverage you want. I sprayed primer, silver and nickel in immediate succession, and in less than five minutes, my pulls were a nice silvery nickel color. I moved the cardboard to the garage so the paint could fully dry (and off-gas; spray paint can stink for several days). Indigo wants to be held. Walls baffle me. More specifically, hanging things on walls baffles me. Many of my walls are bare because I cannot figure out what to hang or where to hang it. The biggest dilemma is the vast expanse of purple wall behind my bed. I can't decide what to do with it. I like the iron headboard but feel it's not enough. On the same wall is my nightstand. I'd planned to paint it black, but it's a bit too large after the addition of the chest of drawers/dog bed. A small shelf might be better than a nightstand. With that, I would need a lamp(s) hung from either the ceiling or the wall. But what to do with the wall? I don't have any photographs to hang. Any art would have to be calming and in limited colors so as to preserve the restfulness of the room. Beyond that... I'm open to ideas. Friday was a difficult day. The CEO at work announced that the company will undergo a major reorganization, moving a large part of the company's focus and resources from R&D to Innovation. I agree that this is probably a smart strategy; however, a change of this magnitude is not without consequences. The one that affects me directly is that I will have a new boss. My current (now former) boss had been considering leaving the company for more entrepreneurial ventures (I wasn't entirely surprised at this), and his departure was accounted for in the reorganization. While I am happy for him, it's a bummer for me. He's a great guy and has been a pleasure to work for. I will now report to his boss, the head of R&D. Former Boss will be around for a few weeks to help with the transition, so I'll work with both him and New Boss for a while. Another consequence with a far greater impact is that 27 people were let go; 11 were from my team (nearly a third of the team). This was completely unexpected and left everyone reeling. It was horrible watching so many people leaving the building. My heart was breaking for them and for the colleagues and friends they'd worked with for years. The one mitigating factor - and the reason my conscience will allow me to go back to work tomorrow - is that the company gave a generous severance package to everyone who was let go, and they have committed to helping them find new employment. I was immensely relieved that I did not lose my job; at the same time, I had a profound feeling of survivor's guilt. I made it through Friday in a daze, and came home feeling drained, sad, and still stunned. In such times, dogs are better than any medicine and worth more than any riches. Never have I been more grateful to have two happy little creatures greet me at the door. They lifted my mood that evening, and in fact, helped me get through this weekend. About one month after their adoption, I am happy to report that Nook and Indigo are doing very well. Indigo in particular has undergone a drastic transformation. She was a sick, scared little bag of bones who wanted only to cling to me. Now she is spunky and alert, and she has gained an entire pound of weight... pretty impressive for a 5.5 pound dog. I can no longer count every rib, though her spine still looks like a stegosaurus. She is eating lots of food (dog food even!) and learning from Nook how to be a dog - exploring the back yard, gnawing on chew sticks, and playing. Nook's idea of playing consists mainly of mock fighting. Nook growls, but her tail is wagging the entire time. She uses her heavier body to push Indigo over, but Indigo then kicks at Nook with all four feet. They roll around in all sorts of funny positions, gnawing at each other's faces. Nook: I'm gonna bite your head! Nook: Now I'm gonna bite your face! Indigo: And become the Snarling Red-Eyed Zombie Dog of Doom! Oh, hi! Didn't see you there. 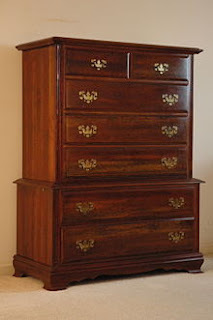 Once upon a time, I bought a chest of drawers at a thrift store. It was the perfect size. It was most definitely NOT the perfect color. I painted it into a more pleasing appearance, and it lived for a few years in stripey, batty glory. Then I decided to make it over again, this time with a bit more sophistication. One thing I've learned from GIY projects is that small details, such as feet and molding, can have a big impact on furniture. So I began this makeover by turning the chest of drawers upside down in order to add feet. I made feet by cutting some balusters into pieces (same as in my kitchen). And attached each foot to the plywood with a screw. Ideally, I would have used just one piece of plywood. However, I didn't have a piece large enough, so I used two separate pieces. I attached the plywood to the bottom of the chest with screws. To hide the plywood edges, I added some wood trim. I righted the chest and added matching trim around the top edges. I painted the piece with black latex paint in a matte sheen. 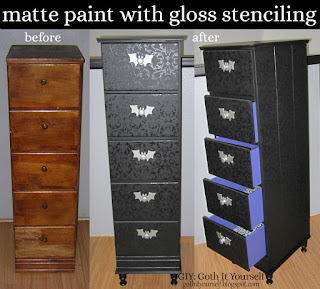 I then used the same paint in a semi-gloss sheen to stencil a design on the drawer fronts and the sides of the chest. I painted the sides and inside of the drawers purple and added adhesive shelf paper to the bottom of each drawer. I painted the knobs with silver (brushed nickel) spray paint. And the makeover was complete! This chest of drawers matches my dresser and IKEA Rast dog bed. When I first got the chest of drawers, I sanded it a little to smooth out the nicks and dings. This wasn't a heavy-duty sanding job, just a bit of hand sanding on the problem spots. I then applied a coat of latex primer before painting. I used Behr Premium Plus paint in "Black." (An unusually simple name for a paint color!) I used the matte sheen for the overall painting and the semi-gloss sheen for the stenciling. The purple is Behr in "Wild Elderberry" (left over from painting my bedroom walls). I applied the paint with a small foam roller, plus a brush for the trim and inside corners. I used a small foam roller for the stenciling as well. I used a Stencil Ease Victorian Baroque Wall and Floor Stencil. It's available on Amazon. Any stencil will work but wall stencils are easier because they are large and have marks to help line up the repeating pattern. I attached the wood trim with construction adhesive. I used masking tape to hold the trim in place while the adhesive dried. The thing might even end up vaguely resembling one of those "chest on chest" style pieces. I painted the chest and the cabinet with black latex paint in a matte sheen. The general idea was to set the Rast on top of the cabinet. To keep the whole thing from being ridiculously tall, I cut a few inches off the sides of the Rast (essentially, I eliminated the toe kick). I had cut a piece of plywood to fit the top of the cabinet. I turned the shortened Rast upside down and attached it to the plywood with screws. I righted the Rast, placed it on top of the cabinet, and attached it with screws through the plywood. To cover the edges of the plywood, I glued on some wood trim. I added the same trim around the top of the Rast. I painted the plywood and trim matte black. 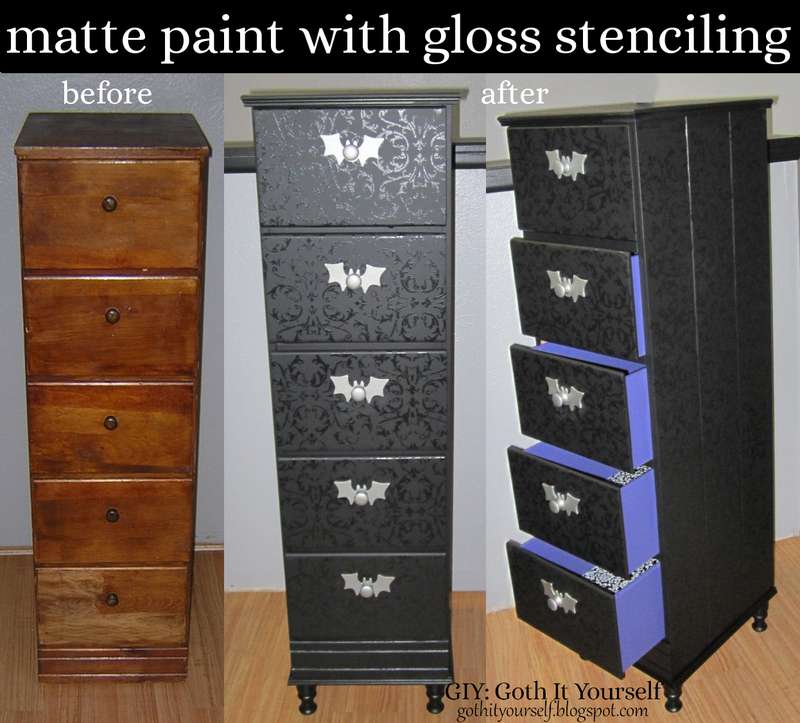 Using the same black paint in a semi-gloss sheen, I stenciled a design on the sides of the piece and on the drawer fronts. For knobs, I combined the plain wood knobs that came with the Rast with wood bat shapes I'd purchased at a craft store. I simply drilled a hole in each shape for the screw to go through. I painted the bats and knobs with silver (brushed nickel) spray paint. I poked the screws through the top of a cardboard box and loosely attached the knobs, allowing me to spray the tops and all around the sides easily. I attached the silver knobs to the drawers. I added a cushion made of memory foam inside a pillowcase. I used the same gloss-over-matte technique on a chest of drawers and a dresser.